Whether you’re self-publishing or submitting your manuscript to a traditional publisher, proofreading your work is important. A carefully proofread book makes you look professional and shows readers and publishers that you care about the quality of your work. Proofreading your own manuscript is not easy, though. After spending months or even years writing your book, you’re very familiar with the text. You see what you think you have written rather than what’s actually on the page. Put your manuscript aside for at least a week after you finish writing. This allows you to get some distance from your work so you’ll see it with fresh eyes and can spot errors that you didn’t see before. Start with spell-check, but don’t rely on it. Spell-check can be a useful tool, but it won’t catch some mistakes (e.g., “to” instead of “too” or “who’s” instead of “whose”). It’ll also give you incorrect advice at times. You’ll still have to read through your manuscript. Change the layout of your manuscript. Changing how your document looks will enable you to see it in a new way so you can catch more mistakes. If possible, print out the entire manuscript and proofread the hard copy. Even if you don’t want to kill a tree, change the font type, size, and color (e.g., change 12-point Times New Roman in black to 14-point Tahoma in brown). Set the line spacing to double. Another option is to proofread the document on your e-reader. Change your environment. To put yourself in proofreading mode, you might also want to do your proofreading in a place different from where you write. Instead of your desk, try the kitchen table, the library, or a coffee shop. Read slowly. Proofreading shouldn’t be rushed. Take your time and focus on every word. Keep a dictionary and a style guide handy. Ask your publisher what dictionary and style guide they prefer. For example, Ylva Publishing uses Merriam Webster’s Collegiate Dictionary, 11th edition, and The Chicago Manual of Style, 16th edition, for manuscripts in American English. When in doubt, look it up. Is it halfhearted or half-hearted? Acknowledgment or acknowledgement? Noticeable or noticable? US or U.S.? U-Haul or U-haul? Take nothing for granted. If you’re not sure about the spelling of a word, look it up in the dictionary. Read the manuscript out loud. When you read the manuscript silently, your brain acts as an autocorrect tool that reads what should be there, not what’s actually on the page. Reading out loud slows you down and makes it easier to focus on what’s really written. It will help you discover missing words and make sure your dialogue sounds realistic. As an alternative to reading the entire manuscript out loud, which can be hard on the voice, have a text-to-speech app read it to you. I use an iOS app named Voice Dream that reads my text back to me while I read along on the screen. Use the search function. For every mistake you find, use your word processor’s find or find-and-replace feature to make sure you didn’t repeat the mistake anywhere else in the manuscript. You can also use the find-and-replace feature to replace double spaces with single spaces. Cover the rest of the text with a piece of paper or a ruler. That way, you’re looking at only one line at a time. Move your finger along to read one word at a time instead of allowing your gaze to race ahead. Read backward, from the end of the story to the beginning. Start with the bottom of the very last page. Some people read sentence by sentence, but if that doesn’t work for you, try it paragraph by paragraph. Reading backward stops you from getting lost in the flow of the story and allows you to focus on the individual words instead. Proofread first thing in the morning. Proofreading needs a lot of concentration, so it’s best to do it while your brain is fresh, not when you’re tired after a long day. Eliminate distractions. Turn off the TV, your cell phone, and maybe even the Internet so nothing will distract you while you proofread. Take breaks regularly. Since proofreading requires intense focus, you can’t do it for hours on end. Take a break at least once an hour, get up from your desk, and give your eyes and your brain a few minutes of rest. Do a second pass. Especially if you find a lot of mistakes in your manuscript, do a second proofreading pass. You could do separate passes for different proofreading issues. Create your individualized proofreading checklist. If you’re like most writers, you tend to make the same mistakes repeatedly. Make a list of your most common mistakes and add to that list whenever you discover a new mistake. Use the list to check each manuscript for those typical errors. 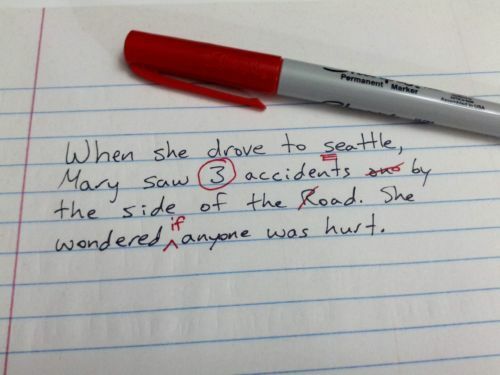 Brush up on grammar rules. If you don’t know the basic rules of grammar and punctuation, proofreading is little more than guesswork, so take the time to learn the most important rules. Get someone else to proofread your manuscript. Having someone else proofread your manuscript doesn’t mean you get out of that task, but having a fresh pair of eyes in addition to your own is always a good thing. Try to find beta readers who are good with spelling and grammar, or trade with a fellow writer—proofread their manuscript in exchange for them proofreading yours. So, how do you approach proofreading your manuscript? Do you have any other tips you want to share? Please leave a comment. I just came across your your tips and I would like to thank you for putting them out there. Glad you find the tips helpful! Best of luck with your proofreading.